LAS CRUCES, N.M. ? Failure is not just anoption ? in fact, it usually comes standard in rocket science. That was the take-home message from a panelof commercial space industry pioneers speaking about their burgeoning industryin a symposium here Wednesday (Oct. 20). Executives from the suborbital spaceshipcompany VirginGalactic, and other private spaceflight efforts like Armadillo Aerospaceand XCOR Aerospace all seemed to agree that a certain amount of flubs areinevitable in their business. The industry and the public must both be preparedfor a certain degree of trial and error before private sector spaceflightreally gets off the ground, they added. "To expect success in flight tests isentirely appropriate, but to be surprised by failure is not," said JuliaTizard, operations manager for Virgin Galactic, during the 2010 InternationalSymposium for Personal and Commercial Spaceflight. XCOR CEO Jeff Greason agreed, adding thatsometimes fellow industry insiders are complicit in perpetuatingmisunderstandings. "If your response to hearing about aproblem that shows up on a flight test is you go off and Twitter to all yourfriends, 'Oh my god, it's the end of the world,' you're not helping,"Greason said. XCOR, like Virgin and Armadillo, isdeveloping its own suborbitalspacecraft designed to take tourists and scientists on brief joyrides thatwould reach space for a few minutes, but would not make a full orbit around theEarth. In order to make the new commercial spaceindustry successful from a safety and financial perspective, companies musthave the freedom to take risks in testing without one failure marking the endof the business, Greason said. "If we get used to the fact that when wecan see behind the curtain ... that it doesn't always go right the first time,I think that not only will that help the industry survive ... but it will bethe one thing that can bring back the culture of risk tolerance," Greasonadded. For its part, ArmadilloAerospace has structured its budget to account for the possible loss of aship or two during the flight testing phase before its vessels are ready totake on passengers, said Neil Milburn, VP of program management for thecompany. "These really are R&D (research anddevelopment) vehicles," Milburn said. "It's a Darwinian approach ?what works, works." The commercial space leaders highlighted theimportance of testing not just their vehicles, but also their customers. Virginhas been doing G-force training with potential passengers to make sure thespaceship will offer an enjoyable ride. "It means relatively little if you'vegot a really safe and tested spaceflight system and a good experience of spaceto deliver with it, if your customer hates every minute of it or gets illduring the ride," Tizard said. 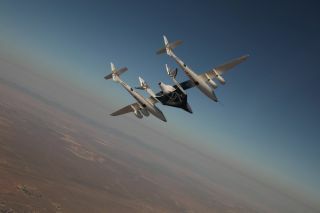 The first passengers on SpaceShipTwo will betrailblazers in their own right, she said. "Our customers are really partinvestors," Tizard said. "Our early customers are really the pioneersof our industry."